Ants may be useful in ways we never imagined. Now a group of researchers from 16 different institutions are collaborating on a project to find out what ants can tell us about genes, environment and aging. Why ants? Studying aging in ants makes sense because the different female castes – the workers (b in figure), soldiers (a in the figure), and queens, – may have the same genes and yet have quite different life spans. Also, ants are relatively long lived as insects go. Some queen ants have lived up to 30 years in the laboratory. NYU School of Medicine researcher Dr. Danny Reinberg, Dr. Juergen Liebig, Dr. Shelley Berger and a number of other collaborators are looking at ant epigenetics, that is, the impact lifestyle and environment have on genes and gene regulation. The results may tell us more about how genes and environment effect aging in humans. The scientists are studying three types of ants. 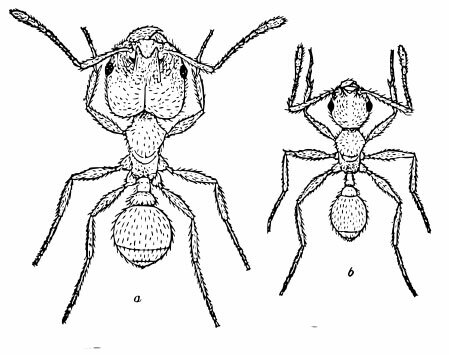 In the big-headed ants of the genus Pheidole, like those shown in the drawing above, the soldiers may be induced artificially, allowing researchers to study the gene regulation and its consequences. They have also chosen Harpegnathos saltator, a species with no differentiation between workers and queens. When one “queen” dies, another worker can take over the reproductive role. Finally, they chose a carpenter ant Camponotus floridanus, for its large size, complex castes, and relatively long life. It will be interesting to see what this research uncovers. Fountain of Youth Found in the Anthill? What Can Ants Teach Us About Aging and Behavior? Interesting stuff – thanks for the additional links.